Every once and a while a recipe comes along that is so decadent, so savory, so amazing, that it requires me to "cheat." Well, its more like a reward than a "cheat". The magical thing about this recipe, #22 on my Top 30 list, is that it's a wife's ultimate secret weapon! Truffle Bacon Mac & Cheese. I make this when I want to do something really sweet for the Hubby, or when I need to apologize for doing something really stupid. When I decided to come up with my top 30, I asked the Hubby if he had any contributions to the list. Before even blinking, he yelled "that awesome Mac & Cheese you make." He didn't even need to specify which one, the "awesome" said it all. We discovered this recipe close to five years ago in a WIRED magazine. Back during a time when we would disagree about what to make for dinner a lot. I was the one that did most of the planning and shopping, so I just made what I wanted, which Hubby protested a little bit. I claimed that I would make any recipe that he wanted me to make (thinking he wouldn't bother). 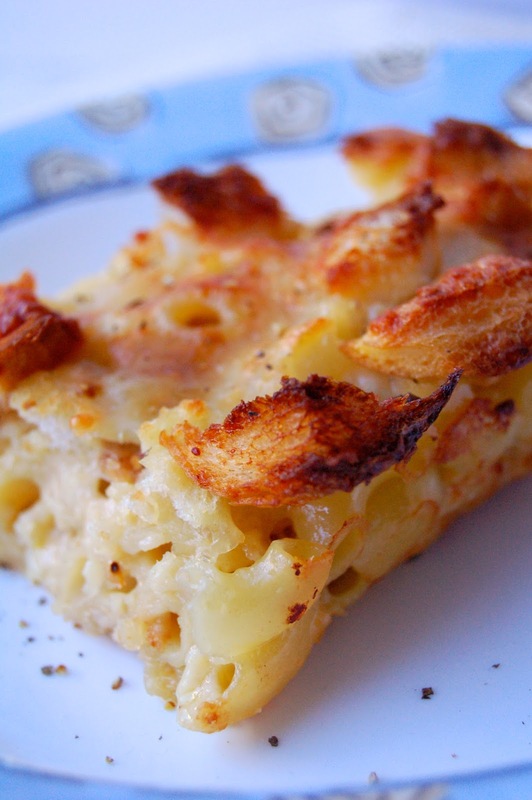 The next day, he comes home with this Truffle Bacon Mac & Cheese recipe. My first thought was, "no way am I making this!" The heavy cream and lack of green anything was enough to stop me. However, I had promised him, so I stayed true to my word. Little did I know that this recipe would become one of my favorite "rewards"! What is not to love about this, bacon, cheese, truffle flavors and more cheese! I will admit that I am not able to eat a lot of this anymore because of my tummy issues, but if you have an iron stomach like my Hubby does, you should make this NOW! Enjoy #22 on my list! Preheat the oven to 375F and butter a large 8x12 baking dish. Cook the macaroni according to the package directions, drain and add into the baking dish along with 1/4 cup cream. In a large mixing bowl, beat the eggs with 1/4 cup milk, then stir in the bread pieces and half the cheeses. Set this aside. Cook the bacon in a large skillet until crispy and set aside, drain most of the grease, but not all. Sauté the shallots and garlic in the bacon grease and cook until slightly brown. Stir in the flour and 1 teaspoon of salt. Cook this for about 2 minutes. Slowly add the remaining milk and cream to the skillet, stirring/whisking the entire time. Bring this mixture to a low boil and then remove from heat. Keep stirring/whisking until cooled down. Whisk in the remaining cheeses and hot sauce until well combined. Stir this into the macaroni in the large baking dish. Add the bacon into the egg/bread mixture and then spread evenly over the pasta. 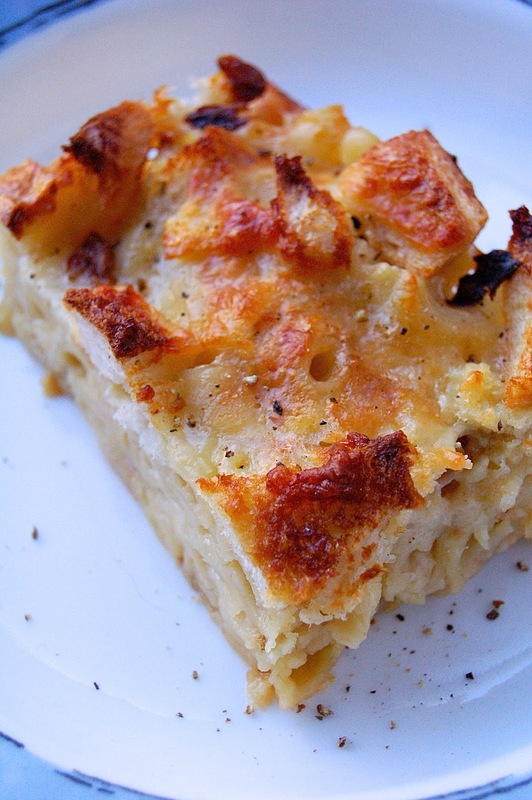 Drizzle the truffle oil over the top of the macaroni mixture if using. Bake for 35 minutes or until golden brown. Let the Mac & Cheese rest for 10 minutes before serving.